In the history of miracles Jesus Christ is said to have walked on water without any props. In 1968 Hata Yogi L.S. Rao, with the connivance of Blitz Weekly, set out to fool a gullible public. Week after week articles published by R.K. Karanjia, told of the supernatural powers of this Hata Yogi. 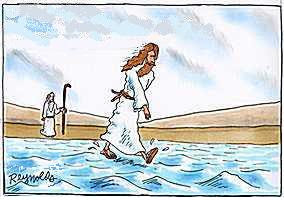 Finally it was announced that, he would walk on water without getting his feet wet. This was advertised as a billion dollar yogic TRICK. Tickets to watch this feat in Bombay one evening were sold in black, and fifty special planes were chartered with camera teams from all over the world to record the yogic walking. The demonstration was inaugurated by Gulzarilal Nanda, the then President of the All India Sadhu Samaj as well as Home Minister in Indira Gandhi's government. Hatayogi showed some tricks like inserting a thread in one nostri I and taking it out through the other, eating glass, walking on fire, and drinking acid: The tank was shown empty under the powerful lights focused on it. After filling it with water, Hatayogi lighted a ganja beedi, approached the tank and prayed while putting one foot in the tank. When his second foot touched the water, he sank like a stone. He was pulled out and explained his failure to the audience. "Last night I fell in my toilet and sprained my leg that is why I cannot walk on water. Our scientists have failed thousands of times to go to moon, but I have failed only this once. When I am cured of this sprain I will walk on water." What really happened was that earlier he had challenged Satya Sai Baba to drink cobra venom which he himself would bring because Satya Sai Baba had claimed to be the avatar of Shiva. They were competitors-not in Hata Yoga but in smuggling. Satya Sai Baba sent his goondas three days before the demonstration and destroyed the water tank Hata Yogi had built in cement. There was no time for a new cement tank to be built again. So a metal tank was ordered. But Hatayogi could not divulge the trick behind his feat. He had asked the manufacturers to put two parallel rails length-wise to strengthen the tank. But they had put cross rails also. Thus the ramp which was to rise when water was filled in the tank could not move. Instead of cancelling the walk, he simply put his feet inside the water and went down. But the public was very angry and wanted the ticket money refunded. Hatayogi had to sell all his properties in Bombay to repay the money. He later settled in Bangalore. When Dr. A.T. Kovoor visited Bangalore in 1977 I managed to get Hatayogi to reveal to Dr. Kovoor his trick of walking on water. The question is why should a person who can walk on water need a special tank to be built? He could have simply walked on the sea at Chowpatty beach. He could have walked on the back-waters of Bombay, or on any river and tank in the area. No human can walk on water unless he is supported by a bridge. For a miracle, the bridge should be invisible. 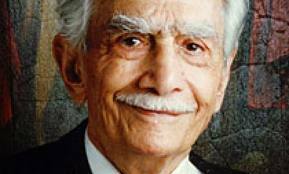 In 1949, I saw a godman walk on the Ganges with two invisible metal ropes under the water. So Hatayogi's plan was to walk on a glass sheet which would rise to the surface when the tank was filled. But agents of Satya Sai Baba had destroyed the cement tank three days before the demonstration. There was therefore no time to build a fresh cement tank. So a metal tank was made by a firm which was so constructed that the glass sheet could not rise when water was filled in the tank. It is a coincident that I was in Bombay when this attempt to walk on water was made and read about it and was greatly disappointed at the failure. My question is why indulge in such tricks and expose our yogic science to such ridicule and shame? There is need for reforms in our religion and the way we practise it. While we agree with your statement that there is need to reform religions and the way they are practiced, we are a bit puzzled at some of your statements. Why were you disappointed at the failure? Did you really believe that by practicing yoga, one would be able to walk on water? Since you were a witness to Mr. Rao’s failed attempt to walk on water, will you be able to send us your experience of it?